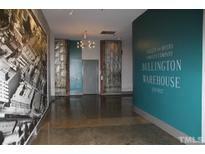 Below you can view all the condos for sale in the Warehouse Condominiums subdivision located in Durham North Carolina. Listings in Warehouse Condominiums are updated daily from data we receive from the Raleigh multiple listing service. To learn more about any of these condos or to receive custom notifications when a new property is listed for sale in Warehouse Condominiums, give us a call at 919-759-5468. Popular Historic Tobacco Warehouse Condo with awesome view of downtown & walking distance to everything * Exposed brick walls * Soaring Ceilings & Windows let in wonderful light * Amazing space for entertaining *Walk-in closet * Remodeled kitchen with convection oven above electric cooktop *Ideal office space or storage overlooks living space * Laundry Room & elevator located next to this unit *Community Room & Covered Patio * Outdoor Patio space for grilling or just to enjoy outside & downtown. MLS#2234226. 3556.